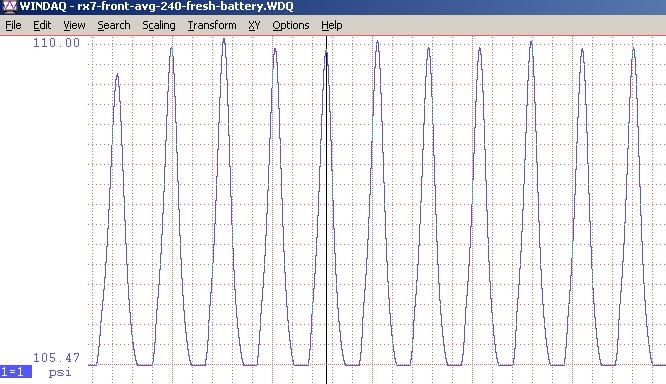 I decided to make a PC-based (Windows 7) compression tester using the entry-level DATAQ (Data Acquisition Products for ANY Application and Budget) acquisition unit and DATAQ software. 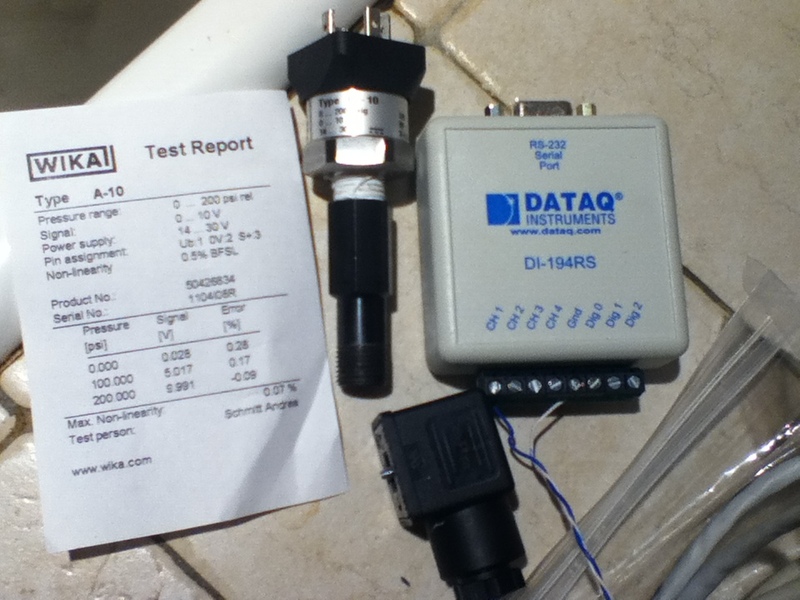 I was able to source a 0-10vdc WIKA A-10 transducer on Amazon. Pretty accurate at 0.17 error at 100-psi. The "key" is the solid-metal spark-plug to NPT adapter, KD Tools 901 Air Holding set, also on Amazon. 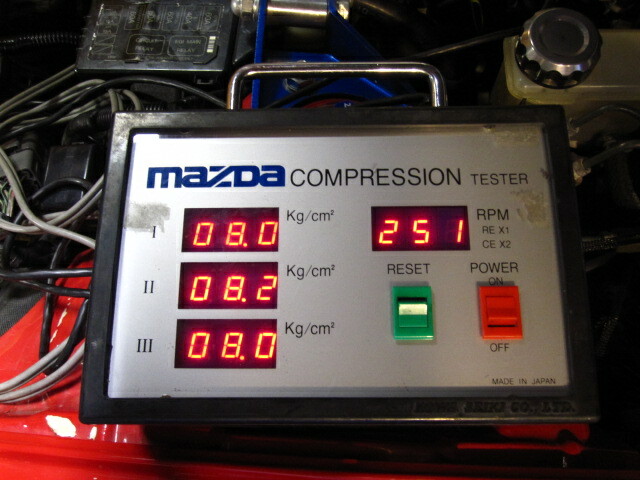 All told $150 instead of $300 for a copy of the $1K+ Mazda compression tester. All readings in PSI (average). Cold engine, cranked with the largest OPTIMA "Blue" deep-cycle marine battery, just charged. I am hoping 96 is not a blown apex seal. A failed apex seal would give you two low numbers. A side seal would more than likely give you one low value, not that 96 is a large variance from 104. That is really cool Neil. Should offer this as a product. It already is a product. He just pieced together a kit himself. And for the price, that's a GREAT product for a turn-key system. I also built one a few years ago using the same hard/software - Dataq DL-194RS. But I went one step further. Did you also buy a very accurate pressure gauge and use it along with an air compressor at around 120 psi to calibrate your system? If not then you are fooling yourself unless ballpark values are OK. 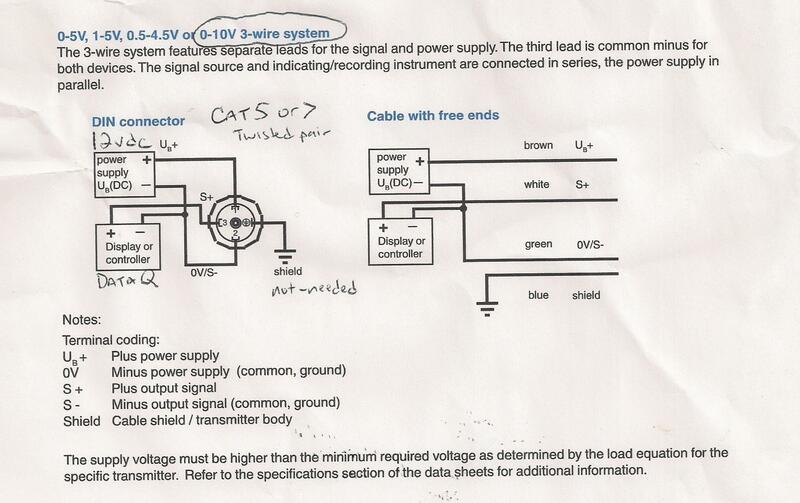 I used the error values on the test sheet (see previous scan) to calibrate, as well as my dry-nitrogen system as a "source" which already has a good regulator for rebuilding my shocks (accurate to a 0.25-PSI). Nice, I got one from Rotary Diagnostics a year ago not knowing that we can build one ourselves. 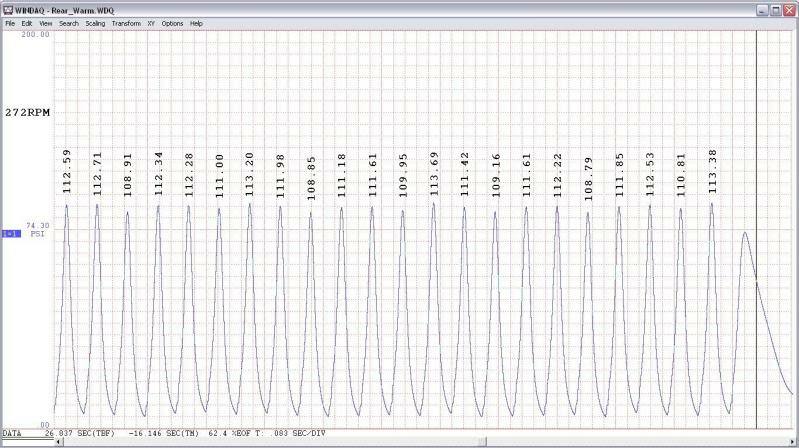 Here's a result of my test, engine warmed up to operation temperature before I did the test. Nice. Always a big fan of the DIY approach! What? No love for Twisted rotors? Cool dude. I get to hang out with him IRL. ^ Love the TR-01, too bad last time I check there's a wait time on the order. Nice job Neil, can't complain about the price you paid for the components . Will try building one soon. Thanks! It seems like the bottom part of the curve is clipped by the x-axis and that your numbers might be a little higher if the curve was adjusted to get rid of the clipping. Although this a year or 2 old I have a question on the principles. The printout suggests that the tranducer's pressure readings are gauge pressure (in other words, it reads 0 in open air). The absolute pressures measured would then be the transducer's output plus atmospheric pressure of 1.0 kgf/m2. 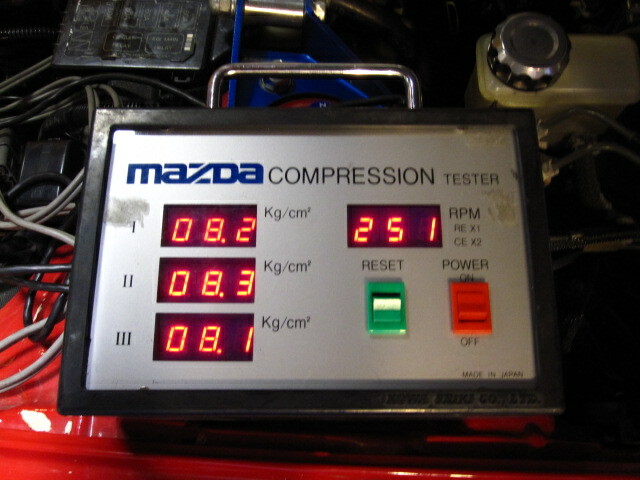 Mazda give limits for the values on their compression tester readout. However, I have found nothing definitive to tell me whether, when using a home-made tester, I should be comparing gauge or absolute values (normalized as necessary) against Mazda's limits. I assume that I should use gauge rather than absolute pressures with such a home-made tester. 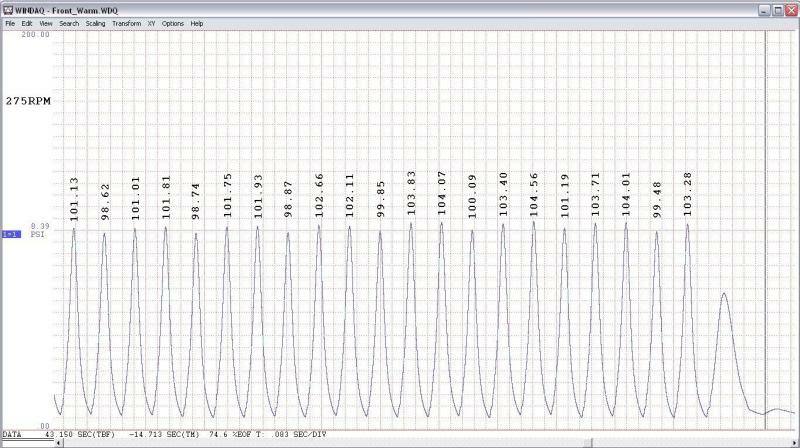 However, getting this right is crucial to the results and I can't find anything from a reliable source. Can anyone help with a definitive answer, preferably with a source, on whether gauge or absolute pressure should be compared (after suitable normalization to 250 RPM) against Mazda's figures? I know that this is 4 years since you posted this, but I just ordered all of the pieces from DataQ and Amazon to build my own. It looks simple enough to do and, after looking at the link for RDS that someone else posted, your approach looks identical in concept. I have an 1984 GSL (bought with 5K miles and now has 188K...2nd engine at 158K that wasn't really needed) and it's not running right. It had been sitting for a while and it just has no power at all. I played with the carburetor (although I need to rebuild it completely) and replaced the ignition components (after 30K miles and they were ugly), but it still has no pop at all. The burn on the 2nd rotor plugs was not nearly as clean as for the 1st rotor. I also considered that something might have taken nest in the exhaust system, but it revs perfectly standing still, even though idle is a little uneven. I figure testing the compression is the next step to diagnosing the problem. If one or more of the seals is leaking, the test will tell the tale. I'm not burning oil so, I'm at a bit of a loss. Hence the C-test. Thanks for your idea and wish me luck.